I wrote a February monthly blog recap last month, and it is a series of posts I plan on continuing. If you missed the first recap, I highly recommend going back and skimming through it! I want to be 100% transparent with readers. I want to track the growth of This Online World from day 1. I want to provide people who are looking to start a blog a realistic expectation of what they can accomplish. I want to share what I learn along the way! So, let’s get to the recap! I managed to hit my target goal of 5 blog posts in February for my own website, which is awesome! I also wrote an additional 10,054 words, so more hefty writing! My favorite aspect of March blogging was my expansion into new topics and less focus on phone farming. Don’t get me wrong, phone farming is great, and my phone farming guide is my most popular post by far. However, writing articles about passive fitness apps and side hustles for college students was definitely refreshing. March was also the first month in which I wrote guest posts! My Phone Farming Experience – on Seller At Heart, a fascinating blog about making money online and with Amazon. $1,000 a Year Side Hustle Challenge – on Financially Mint, an awesome blog about student finance, investing, and ways to make money. I’m very excited for the opportunity to interact with other bloggers and to reach new audiences. If you have some time, I highly recommend taking a look at both Seller At Heart and Financially Mint. Plus, I think guest blogging in March helped establish 2 solid backlinks to This Online World, which is always nice in terms of SEO and driving traffic. I’m happy to have smashed my March traffic goal of 1,500 page views. In March, This Online World saw 4,527 page views. Search Engines: Search engine traffic still make up the majority of my website traffic, which is incredibly exciting. Referrals: Say no more to StumbleUpon or Pinterest, and welcome Quora and Reddit into the mix (I’ll mention these two in a bit). Session Duration: I want to lower my bounce rate over time, but I think we’re on our way there! Remaining Agile: I’ve made some quick switches to Quora and Reddit this month and have placed less time into Pinterest, Facebook, StumbleUpon, and other sources. 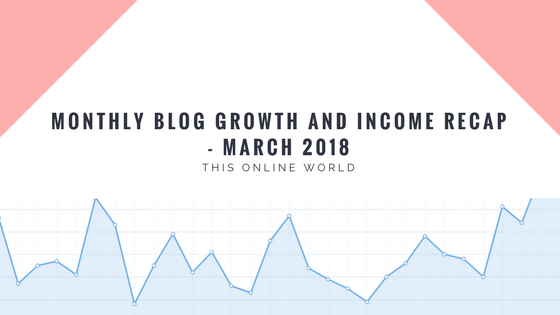 While I still haven’t generated a reliable or significant income stream from blogging, March was a great month for income when compared to the $57.86 earned in February. 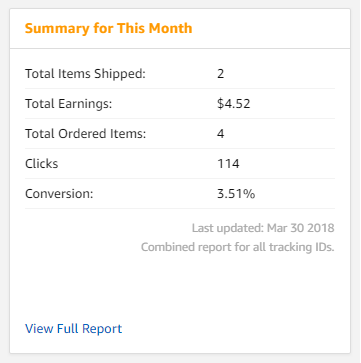 $4.52 earned, compared to $0.72 in February. An increase in traffic is obviously related to higher blogging earnings, so this isn’t too surprising. The affiliate revenue is now largely coming from my Twitch Streaming Guide. However, I am happy to see many clicks coming from my where I linked to some useful microphones and webcams. Hopefully some This Online World readers have started the journey of Twitch streaming! 2 of the items haven’t even shipped yet (they are taking forever) so some additional income will be coming in when they finally ship! Phone Farming – $40. I had a bit of technical difficulties with MobileXpression this month but was still able to earn $40 of passive income, which is always great! I will push for $45-$50 in phone farm earnings for the month of April, and I might buy another device. Cashback with Drop and Carrot Rewards – $6.50. I’ve seen increased earnings since linking Carrot Rewards to Drop. Additionally, I also referred 1 user to Carrot Rewards and 1 user to Drop for an additional $2. If you haven’t already, I definitely recommend downloading Drop and Carrot Rewards to earn an easy $5/month just for walking and answer a survey every now and again. Sign up for Drop with my referral link and make an extra $1 while supporting This Online World. 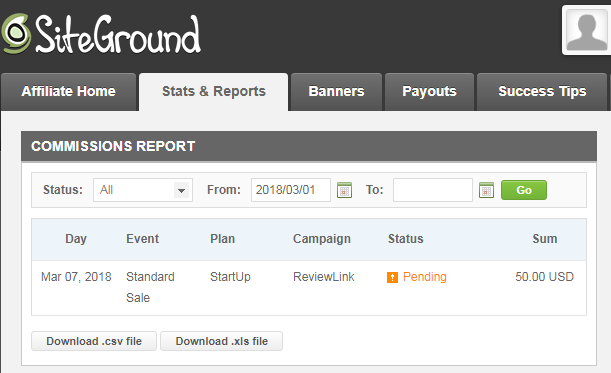 SiteGround Affiliate Income – $50. This was an exciting aspect of March. Someone signed up for SiteGround WordPress hosting after reading my SiteGround Hosting Review and the sale earned me a $50 commission. The sale is still pending, but If they don’t cancel their service by April 7th I will earn $50. I’m also very happy to know a reader took my SiteGround hosting recommendation! Total: $96.50. This is almost double the earnings from February. I was lucky to get an affiliate sale for the SiteGround hosting plan, but perhaps there will be more in the future! March has seen steady organic traffic growth from search engines and exciting growth from referral traffic. However, one of the most important lessons I have learned from blogging and content promotion in March is to watch your bounce rates. 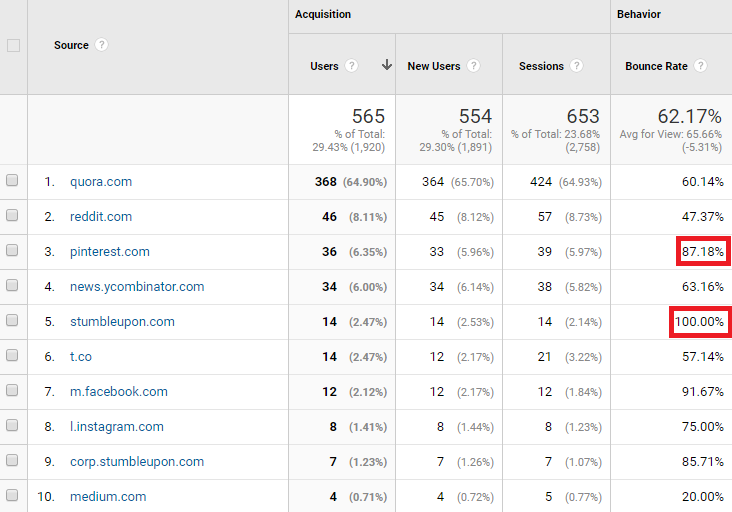 If you examine the bounce rates for Pinterest, StumbleUpon, and Facebook, you’ll see they are pretty abysmal. Your bounce rate indicates the percentage of single page sessions in which no interaction occurred. Essentially, bounce rate indicates if people immediately click the back button when they come to your blog. A 62% average isn’t horrible, but it isn’t spectacular. However, bounce rates of 80% plus like Pinterest and %100 on StumbleUpon clearly don’t accomplish much. I’ve read plenty of articles that praise Quora as being the hidden gem of referral traffic. I have ever tried Quora in the past but never witnessed great success with the platform. I’d write long, detailed posts, only to scrape a handful of views and never see any return or provide any value to readers. 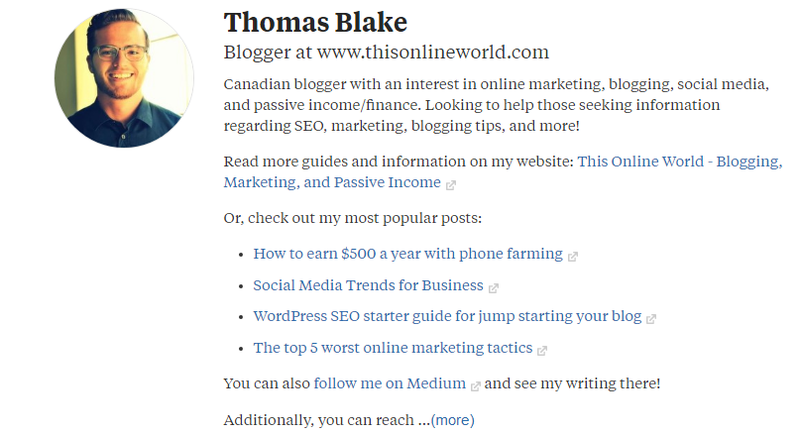 However, after getting some tips from Peter at SellerAtHeart and fine-tuning my Quora strategy, I can definitely say that Quora is a great source of traffic for your blog if you put in the time. As you can see, within the last 30 days I have received almost 61,000 views on Quora. This has translated into 424 sessions on This Online World, with a bounce rate of 60.14% (you can see the data in the referral traffic stats from Google Analytics above). I’ve only written 44 answers on Quora, with 23 being in the month of March. That particular post was similar to my February blog recap. I simply shared a transparent recap of how much I had earned from blogging for 1 month and some of the lessons I had learned along the way. People seemed to really enjoy the openness amidst hordes of answers that promised aspiring bloggers millions of dollars. You can read the entire answer thread here. One thing I will say is that I did not find that thread by accident. When you write on Quora, you need to work smart, not hard. Find popular posts that have a combination of high view numbers and followers. During my first Quora writing attempt I just answered questions as they popped up in my newsfeed. After learning more about Quora, I started to seek out the hidden diamonds of threads. Nothing too popular or dated (which can cause a question to become locked from future edits), but relevant enough to catch a spark and grow. The particular thread I joined for my mini viral post had 130,000 views and 84 followers, just to give you an idea. 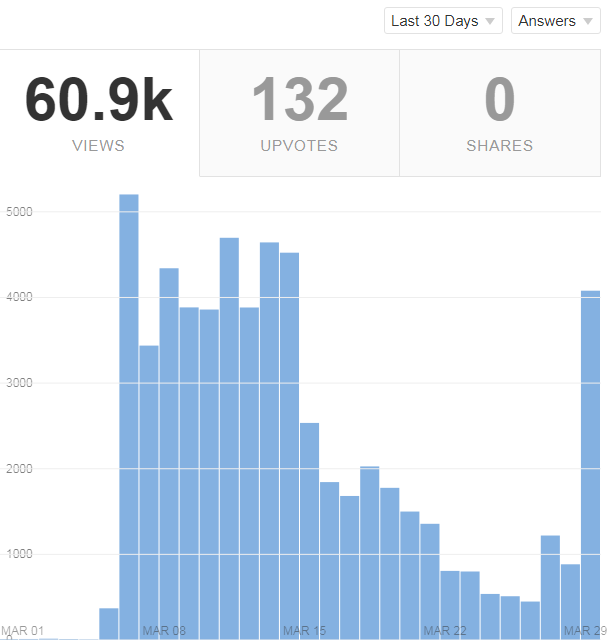 So, what are some other tips for driving blog referral traffic from Quora? 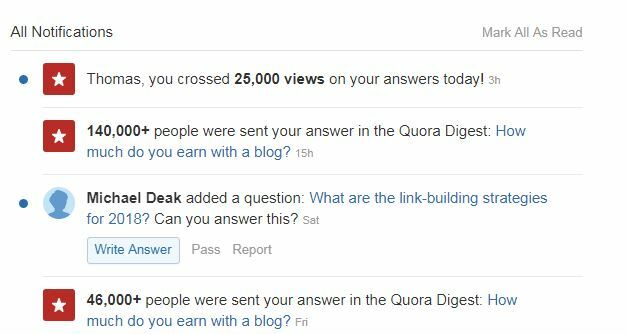 Answer relevant questions: If you want to drive quality traffic that doesn’t just bounce, answer Quora questions that are related to your niche. I only answer questions related to passive income, WordPress, investing, or SEO. Provide value: Don’t just shamelessly plug your blog. Answer the question that is being asked, go in-depth, and link your website or other resources where appropriate. Use images: Quora is deceptively visual in nature. When you’re skimming through dozens of answers in a feed, an eye-catching image can go a long way in making you stop. Don’t be selfish: I like to up-vote other answers, even if they are in a thread I have answered. If you up-vote answers, people may stumble across your profile and return the favor as well. Plus, sometimes people just have incredible answers! 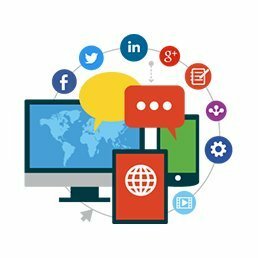 Optimize your profile page: Speaking of profiles, be sure to use your profile page on Quora to promote your blog and writing. It it personalized, but also serves as a way to display This Online World to my readers and highlight some of my interests and best articles. In some sense, you can think of Quora as your miniature blog. That isn’t actually my photo (I just like using that stock image dude everywhere I go), but you get the idea. Just be sure to provide value to readers, remain genuine, work smart, and you should see the results. I’ve been a long time lurker on various subreddits such as r/Beermoney, r/Blogging, and r/passiveincome. Now that I’m blogging, I’ve started contributing to r/Beermoney and r/Blogging whenever I can answer someone’s question or provide a bit of insight. The key to Reddit is to not overly self promote. Reddit is a great community in this regard. You can find great information, seek advice, and the goon who spams his own content typically gets down-voted into oblivion. 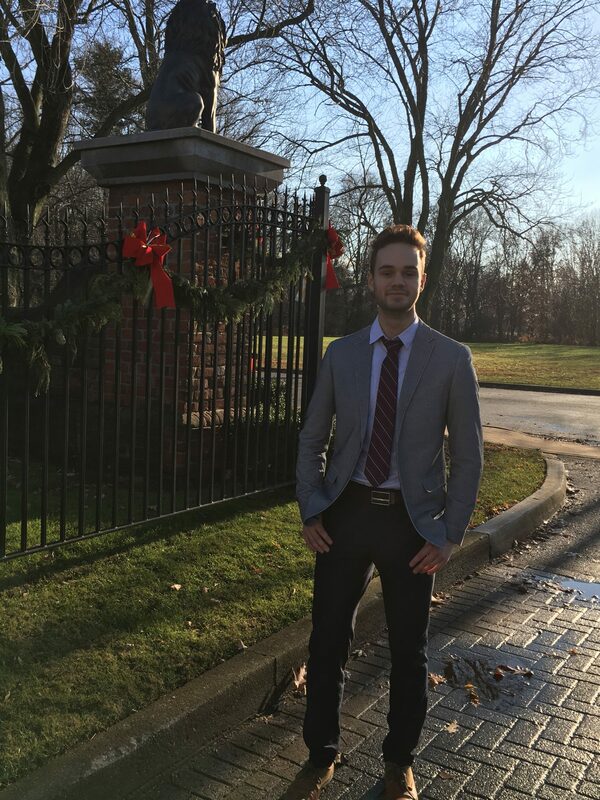 Over the last few weeks I’ve been answering questions on Reddit and participating in communities. However, I also decided to share my February blog recap on r/Blogging. The post received 674 views and 19 up-votes, as well as some great discussion. In the post I shared some lessons I had learned from blogging, including how to use the sky scraping technique and rank well on Google using SEO best practices. All-in-all, Reddit accounted for 57 sessions in March. While this isn’t close to the amount of traffic Google or Quora are driving, the users still seem interested in my content and enjoy reading, which is ultimately what I care about. The bounce rate for my Reddit referral traffic is also 47.37%, which is awersome! Additionally, by being more active on Reddit I’ve also secured both my guest posting opportunities and learned countless blogging tips, tricks, and useful tools. Ultimately, I highly recommend putting some time into Reddit if you are a blogger. Provide value to the communities you join and follow Reddit etiquette. Don’t overly self-promote. Often times, you will be asked to link to your content anyway. Don’t be afraid to ask your own questions. Go above and beyond. If you help someone on Reddit, you might just have earned a fellow friend and blog reader for life. I’m looking to continue growing This Online World and plan to really make some strides in April. Reach 20 email subscribers (currently at 11). Write a “how to stat a blog” or “how to do keyword research” post that is actually useful. Complete the Etsy case study (this got pushed back from February). Improve the landing page speed of This Online World. Thanks so much for reading! If you want to stay up to date with This Online World as posts are released, be sure to subscribe!